PanARMENIAN.Net - The Islamic State militants attempted to break through the siege imposed by the Syrian Army on Safa Hilltops of east Swaida. However, the operation ended up in complete fiasco, Al-Masdar News reports. According to a military source, six IS jihadists on 3 motorcycles attacked the government troops surrounding the group’s stronghold in bid to break the siege. The attackers were dealt with appropriately by the Syrian Army fire power. All the militants have been killed, their motorcycles destroyed. 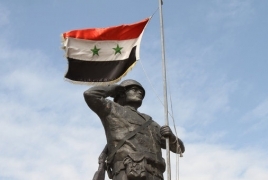 The attack comes as the Syrian forces tighten noose around the terror organization in its last bastion of east Swaida.